Mazes are a great way to increase hand-eye coordination, bolster problem-solving skills, sharpen reasoning, and more. 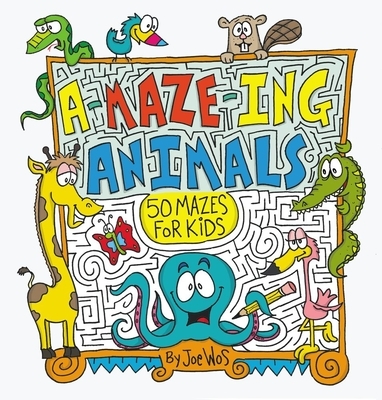 You'll get all that and then some with these 50 colorfully illustrated mazes that feature fully solvable characters, cartoon elements, and imaginative creatures that figure prominently along every start-to-finish path. Themed, integrated animal illustrations (set within the mazes) are fun, playful, and perfect for big kids and grown-ups too. Besides navigating the usual twists and turns of a traditional maze path, puzzle-solvers will have to navigate through crazy cartoon features, like a dinosaur's mouth, a bat's wings, a vulture's beak, a frog's tongue, and more. There are dozens of dead ends, illusions, twists and turns that increase with the difficulty level. It's not just thoroughly entertaining... it's absolutely A-MAZE-ING.